Party planning for Bar and Bat Mitzvahs? Caricaturist artist sketches comic portrait of Bar/Bat Mitzvah party guest either on paper, frames or tee shirts or boxer shorts. Candy Sculpture Artist quickly creates beautiful rice animal candy. Party guests step into Money Booth / cash cube and grab as much money as they can before the time is up as cash is blown about the booth. A Bar/Bat Mitzvah favorite! 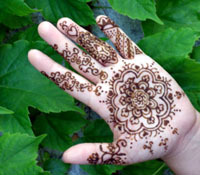 Henna tattoo is applied by a highly trained artisan with a large selection of designs to choose from. Airbrush party guests name & designs on tee shirts, boxer shorts, towels, pillow cases or canvas bags. 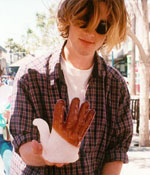 Duplicate the hand with wax hand mold. 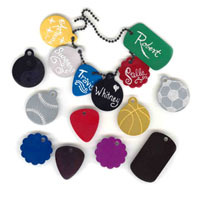 Fun and exciting for party guests to participate. Computer with thousands of names types out the meaning and the character traits of the guest's name, on a special 8.5" x 11" colorful scene background. It's then mounted on a 11" x 14" black cardboard. Can produce 20 to 25 per hour. A profile silhouette cut-out of Bar/Bat Mitzvah party guest. 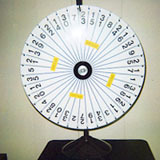 Each Bar/Bat Mitzvah party guest spins the wheel of fortune to win a prize. 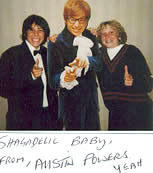 Polaroid picture taken of Bar/Bat Mitzvah party guest next to a life-size photo of a celebrity and placed in a matted frame. Origami paper artists folds paper into various forms. Can even fold dollar bills into animals. Glass sculpture artist makes glass animals. Music from the 40's thru current. Two thousand jukebox selections set on free-play. Volume control. 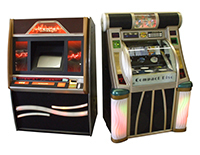 A wide variety of video games and pinball machines to choose from and set on free-play. 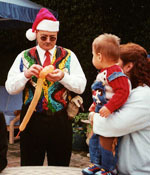 Balloon sculpture artist creates balloon animals, swords, hats etc that delight children and adults alike. 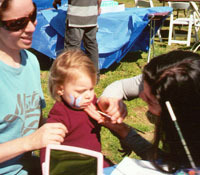 Face Painting Artisan applies designs to children and adults. Non-toxic paint used.